First, of course, make sure you have a complete list of all the players trying out. Explain your rules, policies, and goals, not only for the try-out, but what you expect for the entire season. Ideally, you'll have a few sessions to evaluate the players... but this is not always the case. Below are some suggestions in how to organize your tryouts. It will be helpful if you have several trustworthy assistants who can help you run "stations" at each of the gym's baskets. It's difficult for one coach to evaluate 50 kids. By using assistants, you can either move around from station to station, or sit up in the bleachers and observe everything. At the end of each practice (tryout session), discuss things with each assistant, getting his/her comments and suggestions... I would jot these things down, keeping notes. Coaches... sign up your entire team! - both Individual and Group memberships are available. Some coaches use a form when rating/evaluating players, giving a score of say 1-5 for each skill for each player. I personally don't like that for several reasons. You lose flexibility using such a system. A scoring system may not take into consideration intangibles such as hustle, attitude, etc... using a scoring system, you could end up with a bunch of kids who may have scored well on their stations, but some of whom are not really "gamers" and do not have the competitive drive. Also, kids feel uncomfortable seeing the coach writing down things on a clipboard... it makes them afraid to make a mistake. Also, spending too much time jotting things down takes away from time actually observing, watching and teaching the kids. You want them engaged, playing hard without fear, and having lots of fun. After a few sessions, you can pretty well tell who the better players are by just observing. As that great philosopher Yogi Berra once said, "You can observe a lot by watching." I would however keep notes of my discussions with each of the assistants, and make my own personal notes immediately after practice. I would of course get some argument from many coaches who do like having a grading system. They will cite that in today's environment, everything must be documented and objectively graded to please parents and administrators and to protect themselves from disgruntled kids and parents. Let's move on to structuring the try-out. Most tryouts will be comprised of (1) drills and (2) scrimmaging. In using drills, observe for not only the skills the players possess, but their general athleticism, speed, quickness, focus, desire, etc. A kid could have real natural athleticism, but not be very skilled yet if he/she has just become interested in basketball and just started playing the game... in a year or two, he/she could be a very good player. As mentioned above, if you have several assistants, you can use all the baskets and set up stations, each station employing a different drill, evaluating a different skill. But I would save time at the end of each session (or the last day) for scrimmaging, 3-on-3, 4-on-4 or 5-on-5 (depending on your numbers). 3-on-3 is probably best as with the smaller number, each player's skills will become more apparent. With 5-on-5, sometimes only certain players seem to have the ball the most. I think scrimmaging is important. Some kids are "gamers"... don't necessarily possess great skills in doing station drills, but are aggressive, get after the ball and play defense and are competitive. You'll only see this if they compete in 3-on-3, 4-on-4, or 5-on-5. I would mix up the teams so that not all the good players are on one team... don't let them get "clicky" and just play with their friends. In 5-on-5 full-court, do not allow them to press... they can pick up their man after half-court. You can do station drills and have players rotate through each of the stations (one station at each basket). Set a certain time limit for each station. The amount of time will depend on the number of players at each station and the total amount of time you have for the session, remembering to allow time for scrimmaging later. Typical station drills would focus on shooting, lay-ups, passing, dribbling, footwork, defense, etc. and you can find many of these drills under "Drills" in the left hand menu. 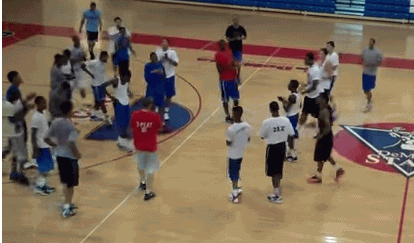 If you don't have enough assistants for each basket, you can run sideline drills en masse. For example, for dribbling and dribble moves drills, have the kids all line up on the sideline. You may need to have each of the kids have a partner, if there are either too many players or not enough balls. Have them dribble to the opposite side and then back... left hand on the first trip, right hand coming back. then give the ball to the partner and he/she goes. Start with a control dribble, then a speed dribble, throw in a couple cross-over dribbles, a rocker-step (hesitation move), and an "in and out" dribble. Don't expect perfection... in fact, don't expect a lot at all with younger kids! 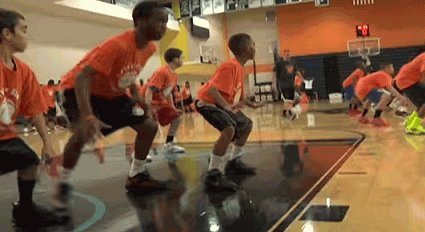 Have someone demonstrate each dribble first. Have each player go back and forth three times (for each dribble move). Consider using the 2-on-0 drills where two players (partners) start on an end line about lane width or a little more apart... they move as quickly as they can passing back and forth (no dribbling) until they reach the opposite end... once they get to elbow, the last pass is a bounce pass and the player shoots the lay-up and they move off. The second twosome can start up the court once the first group has crossed the half-court line. This drill will show you who can pass and catch on the move and will show footwork and coordination, in addition to how quickly players move, and how well they can shoot a lay-up. Of course, if one good player is partnered with a poor player, you have to take that into consideration. Rather than full-court you could also run this as a half-court drill, utilizing both halves of the court, with each twosome starting at the half-court line. Another good overall en masse drill is the full-court Dribble-Moves Drill. Another way to assess for quickness, conditioning, etc is to simply run a couple "gut-busters" or sprints up and down the court. Defensive slides diagonally down the court (Z-Drill) is another good drill. You can probably think up some additional simple drills. But keep it simple and fun. Be positive and encourage all the kids, not just the best players.